Vibrionaceae are Gram-negative organisms and facultative anaerobes, capable of fermentation. They contain oxidase and have one or more flagella, which are generally polar. Originally, these characteristics defined the family, which was divided into four genera. Two of these, Vibrio and Photobacterium , correspond to the modern group, although several new genera have been defined. Genetic studies have shown the other two original members— Aeromonas and Plesiomonas —belong to separate families. The family Vibrionaceae currently comprises eight validly published genera: Aliivibrio,  Catenococcus, Enterovibrio, Grimontia, Listonella, Photobacterium, Salinivibrio, and Vibrio; although the status of Listonella has been questioned. 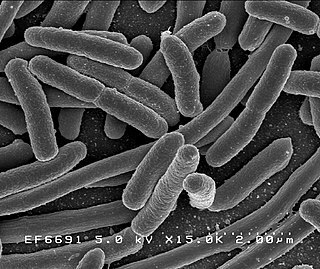 Photobacterium is a genus of gram-negative bacteria in the family Vibrionaceae. Members of the genus are bioluminescent, that is they have the ability to emit light. Neurotoxins are toxins that are destructive to nerve tissue. Neurotoxins are an extensive class of exogenous chemical neurological insults that can adversely affect function in both developing and mature nervous tissue. The term can also be used to classify endogenous compounds, which, when abnormally contacted, can prove neurologically toxic. Though neurotoxins are often neurologically destructive, their ability to specifically target neural components is important in the study of nervous systems. Common examples of neurotoxins include lead, ethanol, manganese glutamate, nitric oxide, botulinum toxin, tetanus toxin, and tetrodotoxin. Some substances such as nitric oxide and glutamate are in fact essential for proper function of the body and only exert neurotoxic effects at excessive concentrations. G. Balakrish Nair is an Indian microbiologist. At present, he is the Ag. Regional Adviser, Research Policy and Cooperation Unit, Department of Communicable Diseases, World Health Organization. Before joining WHO, he was the Executive Director of Translational Health Science and Technology Institute (THSTI), Faridabad, NCR, India. Before joining THSTI, he was working in NICED as the Director. He has also served as the director of Laboratory Sciences Division at the International Center for Diarrhoeal Diseases Research,, Dhaka, Bangladesh. Aposymbiosis occurs when symbiotic organisms live apart from one another. Studies have shown that the lifecycles of both the host and the symbiont are affected in some way, usually negative, and that for obligate symbiosis the effects can be drastic. Aposymbiosis is distinct from exsymbiosis, which occurs when organisms are recently separated from a symbiotic association. Because symbionts can be vertically transmitted from parent to offspring or horizontally transmitted from the environment, the presence of an aposymbiotic state suggests that transmission of the symbiont is horizontal. A classical example of a symbiotic relationship with an aposymbiotic state is the Hawaiian bobtail squid Euprymna scolopes and the bioluminescent bacteria Vibrio fischeri. While the nocturnal squid hunts, the bacteria emit light of similar intensity of the moon which camouflages the squid from predators. Juveniles are colonized within hours of hatching and Vibrio must outcompete other bacteria in the seawater through a system of recognition and infection. Spot 42 RNA is a regulatory non-coding bacterial small RNA encoded by the spf gene. Spf is found in gammaproteobacteria and the majority of experimental work on Spot42 has been performed in Escherichia coli and recently in Aliivibrio salmonicida. In the cell Spot42 plays essential roles as a regulator in carbohydrate metabolism and uptake, and its expression is activated by glucose, and inhibited by the cAMP-CRP complex. Photobacterium profundum is a deep sea Gammaproteobacterium, belonging to the family Vibrionaceae and genus Photobacterium. Like other members of this genus, P. profundum is a marine organism and has two circular chromosomes. P. profundum is a gram-negative rod with the ability for growth at temperatures from 0 °C to 25 °C and pressures from 0.1 MPa to 70 MPa depending on the strain. It has a requirement for salt, is able to metabolise a wide range of simple and complex carbohydrates and has two flagella systems. Cells are rod shape, 2-4μm long and 0.8-1.0μm wide, with a single unsheathed flagella. This bacterium was originally isolated in 1986 from the Sulu Sea and there are currently 4 cultured wild-type strains of P. profundum,. Zosimus aeneus is a species of crab that lives on coral reefs in the Indo-Pacific from East Africa to Hawaii. It grows to a size of 60 mm × 90 mm and has distinctive patterns of brownish blotches on a paler background. It is potentially lethal due to the presence in its flesh and shell of the neurotoxins tetrodotoxin and saxitoxin. Aliivibrio is a genus in the phylum Proteobacteria (Bacteria). Bioluminescent bacteria are light-producing bacteria that are predominantly present in sea water, marine sediments, the surface of decomposing fish and in the gut of marine animals. While not as common, bacterial bioluminescence is also found in terrestrial and freshwater bacteria. These bacteria may be free living or in symbiosis with animals such as the Hawaiian Bobtail squid or terrestrial nematodes. The host organisms provide these bacteria a safe home and sufficient nutrition. In exchange, the hosts use the light produced by the bacteria for camouflage, prey and/or mate attraction. Bioluminescent bacteria have evolved symbiotic relationships with other organisms in which both participants benefit close to equally. Another possible reason bacteria use luminescence reaction is for quorum sensing, an ability to regulate gene expression in response to bacterial cell density. 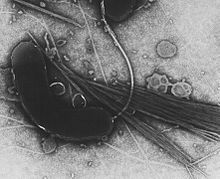 Vibrio aerogenes is a gram-negative organism that is rod-shaped and has a two-sheathed flagella that is found on one side of the cell that makes it motile. When it is grown on polypeptone-yeast (PY) plate medium, the colonies are usually round and flat. It is an organism that is mesophilic which means it likes temperatures that are between 20-45°C. In addition, it is facultatively anaerobic, which means it can survive with or without oxygen. This is a marine bacteria that is most commonly found in temperatures between 30°C and 35°C and pH 6-7. It requires Na+ to grow and this is what makes the marine environment a necessity for this organism. V. aerogenes can ferment glucose and a few other carbohydrates to yield organic acids. ↑ Urbanczyk H, Ast J, Higgins M, Carson J, Dunlap P (2007). "Reclassification of Vibrio fischeri, Vibrio logei, Vibrio salmonicida and Vibrio wodanis as Aliivibrio fischeri gen. nov., comb. nov., Aliivibrio logei comb. nov., Aliivibrio salmonicida comb. nov. and Aliivibrio wodanis comb. nov". International Journal of Systematic and Evolutionary Microbiology. 57 (12): 2823–2829. doi:10.1099/ijs.0.65081-0. PMID 18048732. ↑ Johnson J (2002-01-05). "Tetrodotoxin". Molecule of the Month. Retrieved 2008-10-07. ↑ Edwards N (1998-08-18). "Saxitoxin". Molecule of the Month. Retrieved 2008-10-07. ↑ Rosenberg, Eugene; Loya, Yossi (2004). Coral Health and Disease (1st ed.). Springer. ISBN 3-540-20772-4.